In an eukaryotic cell, the mRNA population constitutes approximately 1% of total RNA with the number of transcripts varying from several thousand to several tens of thousands. Normally, the high abundance transcripts (several thousand mRNA copies per cell) of as few as 5-10 genes account for 20% of the cellular mRNA. The intermediate abundance transcripts (several hundred copies per cell) of 500-2000 genes constitute about 40-60% of the cellular mRNA. The remaining 20-40% of mRNA is represented by rare transcripts (from one to several dozen mRNA copies per cell) [Alberts et al., 1994]. Such an enormous difference in abundance complicates large-scale transcriptome analysis, which results in recurrent sequencing of more abundant cDNAs. 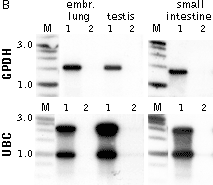 Trimmer-2 kit is designed to normalize amplified full-length-enriched cDNA prepared using Evrogen Mint cDNA synthesis kits. The resulting cDNA contains equalized abundance of different transcripts and can be used for construction of cDNA libraries and for direct sequencing, including high-throughput sequencing on the next generation sequencing platforms (Roche/454, ABI/SOLiD or Illumina/Solexa). The kit also includes special adapters allowing use of Clontech SMART-based kits for construction of cDNA intended for Trimmer-2 normalization. 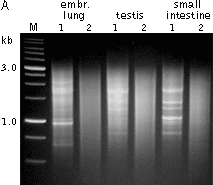 (A) Agarose/EtBr gel-electrophoresis of non-normalized (1) and normalized (2) human cDNA samples; (B) concentration of abundant transcripts in these samples revealed by Virtual Northern blot. GPDH – glyceraldehyde-3-phosphate dehydrogenase; UBC – ubiquitin C; M, 1-kb DNA size markers (SibEnzyme). 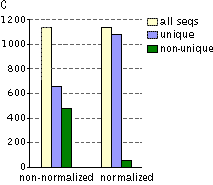 (C) Normalization significantly increases gene discovery rate of cDNA library. Transcript distribution in standard and normalized cDNA libraries from Aplysia neurons: yellow – all sequences, blue – unique sequences; green – non-unique sequences.